One Jay we do not have in the West is the Blue Jay. The ‘why’ of this is puzzling simply because the weather and climate here rather mirror that of Eastern Provinces and States (minus the humidity, thank heaven). As annoying as this bird can be, the sheer pleasure it appears to take in creating continuous drama — the screeching cry it passes off as ‘song’ turns the lovely silence of a Sunday morning into a birdie alarm clock — makes the Blue Jay an attention receiver (like that kid you always remember from Grade 4). And….the Blue Jay–like most Jays–is beautiful. Their blue, black and white colouration is as dramatic as the Blue Jay personality. They have the ability to turn any bird feeder situation into a Three Stooges food fight. And for all these reasons, make a great subject for painting. 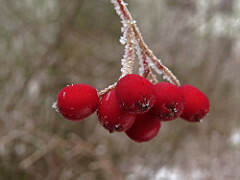 A favourite natural food in Winter is the Mountain Ash berry. These trees are in abundance here in Southern British Columbia, and grow very large, and are responsible for allowing the N. American Robin to return very early–often at the end of February–sustaining them until the ground becomes warm enough for pursuing worms. 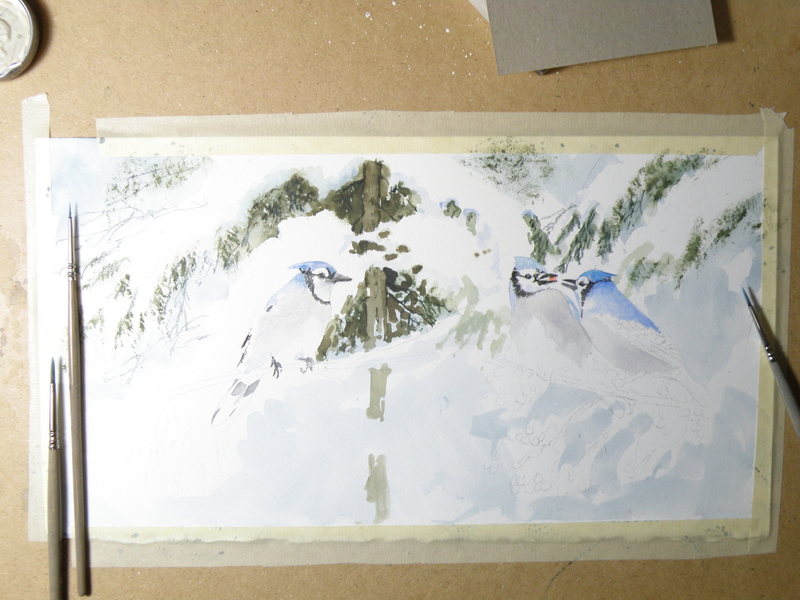 Choosing both Blue Jays and Mountain Ash in Winter makes for great contrast in colour, and a lively composition for painting. Now we’ll just have to see how it all turns out….